I love dessert and since Jack has come along I have been trying to get a handle on these sweet cravings. I am not sure if they are cravings as much as I was just to used to being able to eat whatever because, hey I was pregnant, I was supposed to gain weight. 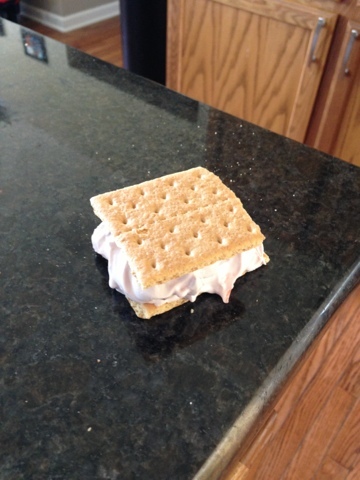 This recipe is easy and much healthier than a traditional ice cream sandwich. 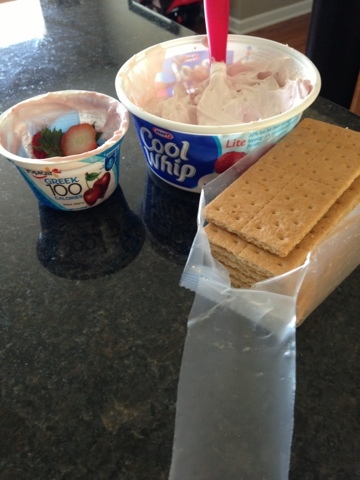 All you do is take a half of container of cool whip and mix in a yogurt. I used greek yogurt because it is what we eat at our house. Then you cut up some fruit and mix it in. I used strawberries. I cut them small and used about 6 of them. Then you layer it between gram crackers and put them in the freezer. They don't take too long to set up. Everyone loved them. I think next time I will use chocolate gram crackers and maybe add some bananas.